From critically acclaimed world historian, Antony Beevor, this is the first major account in more than twenty years to cover the whole invasion from June 6, 1944, right up to the liberation of Paris on August 25. It is the first book to describe not only the experiences of the American, British, Canadian, and German soldiers, but also the terrible suffering of the French caught up in the fighting. This is a superb book and a model of the historian’s craft. It stands as the best one-volume history of this decisive military engagement. Antony Beevor's impeccable attention to detail ensures that the horrors of the Normandy invasion are brought vividly to life..
All this was 65 years ago. The scars of Normandy have healed surprisingly quickly. Beevor’s book superbly brings the events of that summer to life again and reminds us of why we should never allow ourselves to forget them. Beevor has a beautiful written style and specialises in a holistic historical narrative style that is always enjoyable to read. He combines sources from both sides in the conflict and makes sure to include the civilian view of affairs to paint a whole picture of complex events. 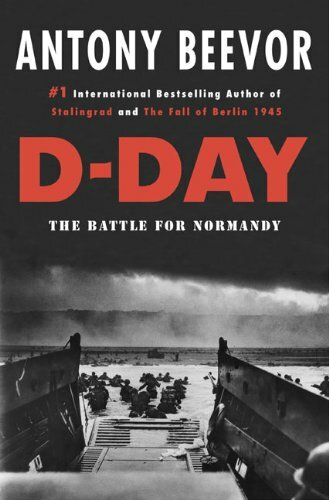 I have enjoyed his previous books and while this has all the hallmarks of his writing I cannot feel that perhaps the history of D-Day has been retrodden once too often. Beevor makes sure the German side of events is represented and clarifies the suffering of the French population during the campaign. He does not gloss over the atrocities and friendly fire incidents on both sides. He is clear-eyed on the numerous conflicts within the allied forces. It is a good, balanced piece of history that refuses to make simple judgements in the absence of evidence and tries to provide the reader with the means to draw their own conclusions. And yet, what more is there that can be said really? Beevor decides against Montgomery in one of the key controversies of the period. He also indicates that he thinks air power was less decisive as a weapon that generally judged while still allowing for its important interdictive effect on supplies and German movement. Excellent account of D-Day and the subsequent fighting in Northern France to the liberation of Paris. Covers all forces fighting in Normandy and includes the impact of the fighting on the French civillians. Worth adding to any World War Two collection. Too much detail of battles and not enough about the genesis and planning of Overlord. Chapter on the liberation of Paris was quite good. Chapter about the Stauffenberg plot was irrelevant. Otherwise for military geeks only. This is brilliant descriptive history, and provides flashes of analysis. For the more serious historian or military thinker, this book will be a good starting point, but is aimed more for the general reader. An excellent read. It gives the big picture of grand strategy and large-scale offensives, but intersperses anecdotes about and quotes from ordinary people which gives it a human touch and makes it very readable. This story of the D-Day landings and the campaign for Normandy takes us right up to the liberation of Paris. It appears to be well-balanced; its criticism of Montgomery is probably pretty mainstream these days. One of the surprises for me here is something you rarely read about: how many American and British troops died from friendly fire. In an operation this huge, really unfortunate mistakes are made. Excellent book with very good narration. Good insights into the casualties and destruction for the citizens of Normandy. They paid a horrific price, particularly in the Caen area for Montgomery's dilatory attitude and execution during this campaign. Wow! This was a long hard read. Not because the writing or the language was difficult, they were, in fact a model of clarity. Beevor has the gift of melding the general story with minute personal details, some humorous, some deeply moving. The exceptional quality of the writing made me want to read every word and this, coupled with a frequent need to refer to the maps to understand who was doing what when to who explains the length of time I spent on this book. It is essentially a story of sacrifice, of young servicemen and of civilians. He uses the phrase "the martyrdom of Normandy" and made me realise the scale of it. I had some idea from my visit to the wonderful Memorial museum near Caen where that city's devastation made starkly clear, but this book points up the scale of the sacrifice made by the people of Normandy. Probably best short description of the Normandy Campaign that I have read. It integrates the suffering of the French, which is good to see. As a Canadian, I believe he under-researched the Canadian contribution, but for all that he was objective. And the boy can write. Well done, a good read.